Home » Blog » Will I run a marathon? Will I run a marathon? I’ve been running for over five years. Thanks to my half marathon challenge I’ve run 15 half marathons since turning 50 in 2013. After completing that challenge it felt like time to have a go at the full 26.2 mile distance. I’ve always felt ambivalent about the marathon. It’s never been a burning ambition of mine, but it is the landmark distance for endurance runners: the one non-runners recognise, even when they don’t know how many miles it is. I entered the ballot for the 2016 London Marathon. I was one of 247,069 hopefuls of whom around 15% were successful in getting a place. I wasn’t one of them, and decided to enter a Spring marathon, Milton Keynes, and an Autumn marathon, the Plusnet Yorkshire Marathon, in the hope of running both. You will be training for three or four months, and the weekly “long run” will take up a big chunk of time on one day each week, as you need both time to do the run and time to recover. Fitting it all in takes planning and discipline. 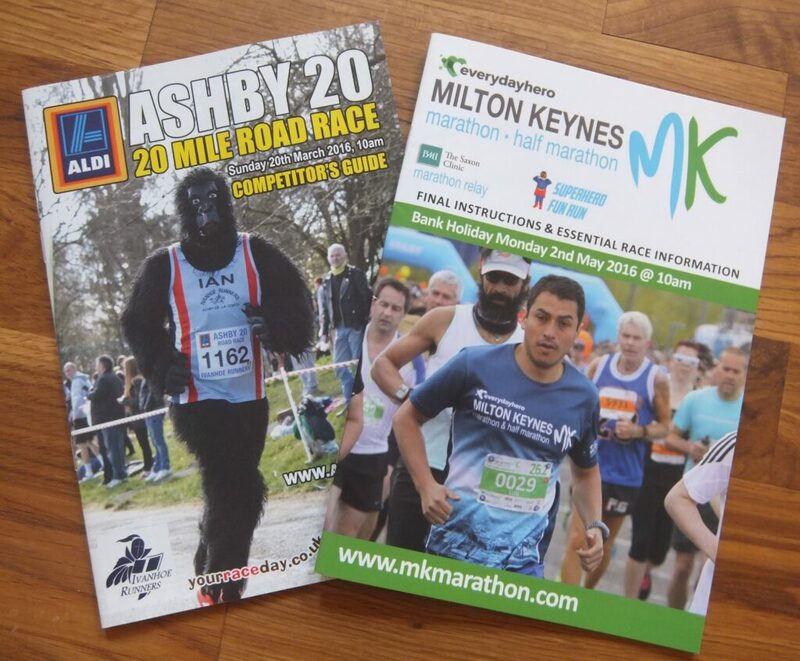 The Milton Keynes Marathon took place on Monday 2nd May. I started training 17 weeks out at the beginning of January. My training was loosely based on an “improvers” training schedule by Phoebe Thomas from Women’s Running magazine. By February I was running between four and five hours a week. You have to get to the start line. Christine Heaton, who I interviewed recently, says that the hardest part of the marathon is getting to the start line uninjured. It is better to be standing on the start line of your first marathon slightly under trained than injured or worried about a niggle! I found friends from my running club to do my long runs with. I love running on my own, but having company made me feel part of a bigger endeavour and helped me to keep going when I was running further than I ever had before. I got to week 9 in my training programme and it all stopped. In the last three miles of my longest ever run (just under 17 miles) I was struggling with a increasing amount of pain in my hip and at the top of my thigh. The 5th March was the last day of marathon training for me, but my two running partners that day both went on to run their marathons in April. Niki ran the Greater Manchester Marathon in a fantastic time and raised over £1,500 for a mental health charity, and Jo was delighted to complete her first marathon at London, having won her place in the running club ballot. In the three months after that day there were eight weeks when I did no running. I went to see my physio twice, had dry needling twice, and went to see the GP. The diagnosis from my physio was that the pain I’m experiencing intermittently is from nerve impingement caused by tightness in muscles in my sacrum and back. After five years of running with almost no time off for injuries I decided to view this as a period of recovery rather than injury. It’s provided me with an opportunity to reflect on what I want from running and the place it has in my life. Running has become part of my identity. When I started I would never have thought of describing myself as a runner or an athlete. Now I think of myself and describe myself to others as a runner. Initially I kept running and work separate but gradually I’ve started to talk about running when I’m working and it has even crept into my LinkedIn profile. A lot of the other physical activity that I do, such as yoga or swimming, is measured in terms of its contribution to my running and to keeping me able to run. During this period of recovery I’ve felt some relief at the freedom from thinking about races, times and performances. I love racing and I love setting myself targets, but it has done me no harm to have a break. I’ve enjoyed having time to do other things, such as gardening and doing more with my partner at the weekends. I’ve been reminded how much I enjoy swimming, especially the feeling that once you find your rhythm you could carry on forever. I’ve started fitness classes because I want to build my upper body strength. However, I’ve also found it hard to describe myself as “injured”. Maybe I equate injury with weakness and somehow despite the undeniable evidence I want to continue to see myself as the runner who doesn’t get injured. After a few weeks of not running I felt happy and free the first time I ran to the woods near my house. I was grateful just to be there and to experience the sense of agency: the power of my body running and taking me to places. Since mid-June I’ve been concentrating on building up my total weekly distance, going for more frequent, shorter runs and counting all of them towards the distance, even ones that are only just over a mile. I’m not paying much attention to pace. In fact I’ve changed my Garmin GPS to show time and distance, rather than time and pace. Towards the end of August I ran 23 miles in a week, and was really pleased. It’s now over 6 months and I am starting to wonder if this intermittent nerve pain will go away. I will carry on with stretching, strength work, yoga and physio visits. As I write this it is 3 weeks until the Yorkshire Marathon. My training has been more of a recovery programme than marathon training. I haven’t done the universally recommended long runs. But I may be at the startline at the University of York on 9th October. At this point completing the distance would be enough of an achievement. Aiming for a time has become less important to me. Perhaps it’s the things that are hard that are really worth doing. I am more committed to the marathon distance now than I was at the start of the year. I will run a marathon…one day. Thank you Steven, which marathon are you training for? I was interested by your site (very rare to see “Injuries” listed as a tab!). Do you ever listen to the Marathon Talk podcast? They’ve talked about paleo (and interviewed Tim Noakes) and the Maffetone method.